Wild Rockets slot machine provides a pleasant break from the every day video slot that we’ve all gotten used to. 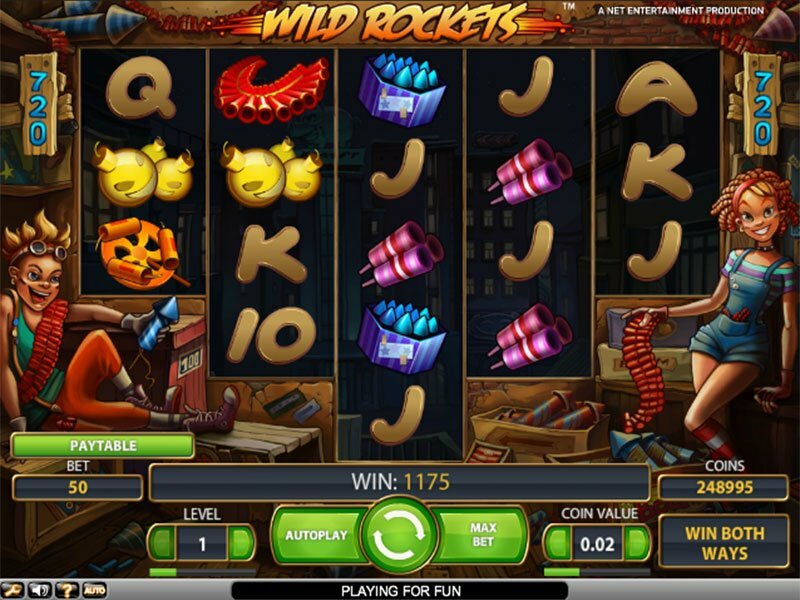 With a unique reel structure, Wild Rockets slot is a great choice for anyone seeking a little variety in their gambling diet. If you’re looking for the best video slot experience you can find however, this certainly isn’t the place. Odds are you’ll find a better game at the same casino as NetEnt itself has much better productions. BANG! POP! BOOM!! POW! Isn’t it illegal to own private fireworks? Technically yes, but you can bend the rules a bit by playing Net Entertainment’s Wild Rockets slot machine. This is one of NetEnt’s simplest games by far. 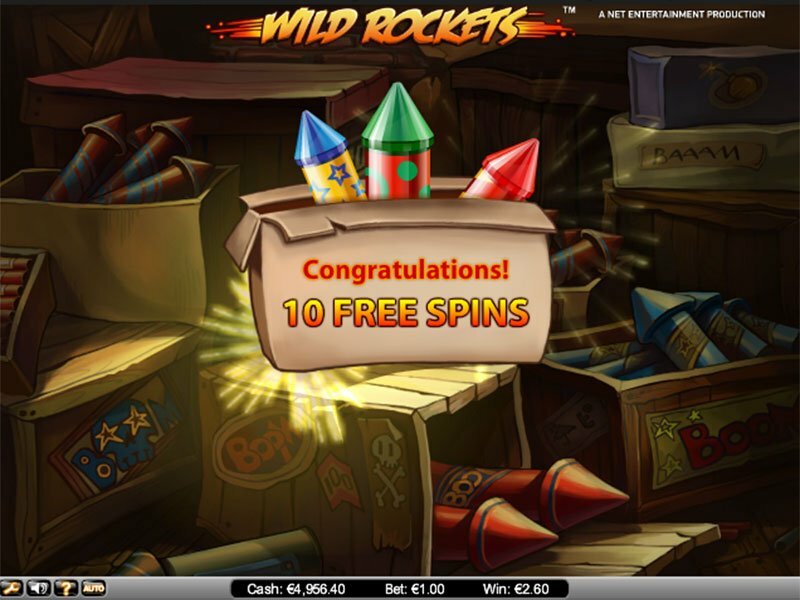 Despite its apparent simplicity however, Wild Rocket slot is still unique for several key reasons and doesn’t leave a serious stain on NetEnt’s positive record. Animations on the reels are near non-existent and the game feels relatively limited to the simple click of the spin button. Special symbols include the wild symbol that expands in an explosion of fireworks and the scatter symbol that triggers free games, and a lot of them. Graphics in Wild Rockets slot software are overly simple in my opinion. The only artistry here are two teenagers sitting next to the reels wielding an army’s ammunition of firecrackers. Animations on the reels are near non-existent and the game feels relatively limited to the simple click of the spin button. Myself, and I’m sure many other players, look for slot machines with a bit more to offer in the land of entertainment. 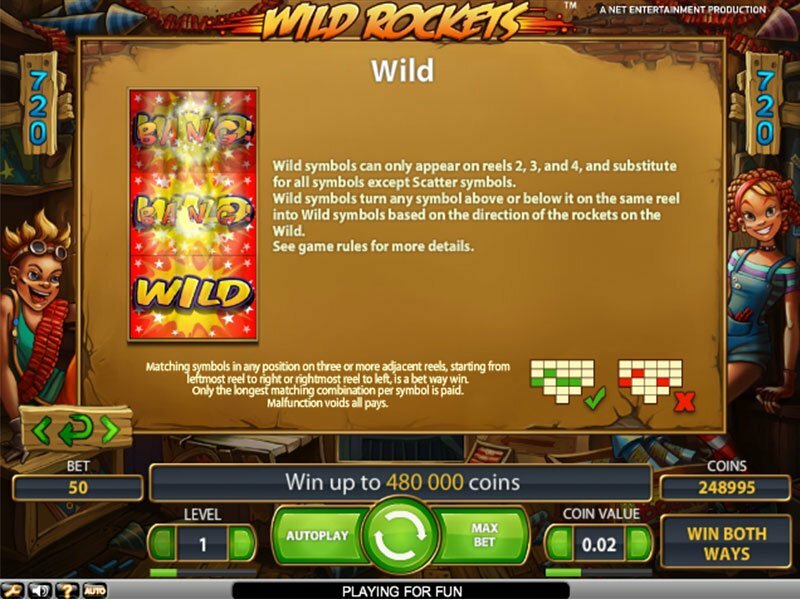 Audio is in the same boat as graphics when playing Wild Rockets slot machine. The game is based on fireworks and explosions, but lacks any type of background music. All by myself I could come up with a melody for a song that might create a feeling of action… something like: du duh da duh da da doooom! Well, you get the picture. Effects are good quality but limited. Wild Rockets slot has a lot of sound potential that hasn’t been used.